Desert Academy, Santa Fe, USA "Our biggest reason for getting CACHEBOX was to be able to stay under 300mbps and still grow digital learning." Jack Brula, McGregor Independent School District 4, USA "The simple web interface has enabled domain owners to make their own changes, allowing IT staff to focus attention elsewhere"
There is no fibre connection between Liberia and international networks so WAT uses a WiMAX network to provide broadband, voice and fax services to over 500 business and residential customers in Liberia. Using a 50Mbps satellite connection for backhaul, WAT needed to ensure it made effective use of limited bandwidth. West Africa Telecom (WAT) is a fully licensed broadband service provider operating in Liberia. Providing an alternative to commonly used 3G mobile data services, WAT offer broadband services via WiMAX with satellite backhaul. As one of only a few broadband ISPs operating in Liberia, WAT’s customers rely heavily on them for dependable, high speed internet access. Up to 6 users connect to each of its customers’ routers, often sharing low bandwidth services. WAT knew it would be challenging to give end users a high quality broadband experience. Fixed telephone lines are available to only 0.1% of Liberia’s population, whilst mobile penetration is over 50% making it the method of choice for voice communication. As such, many of WAT’s customers do not use the network for voice and the vast majority of traffic is HTTP. West Africa Telecom purchased a CACHEBOX230 and deployed it using Cisco’s Web Cache Communication Protocol (WCCP), present on Cisco routers and switches (and one or two other brands) for establishing interaction with web caches. WCCP establishes and maintains the transparent redirection of traffic, optimises resource usage and improves redundancy. This was ideal as WAT wanted to be sure that in the event of an issue, network traffic would continue to flow. Achieving bandwidth savings of 30% and more, WAT’s customers immediately benefited from much faster internet access. “My customers’ experience was improved and they trust WAT to provide a reliably fast connection,” Kamal explained. WAT’s customers initially experienced lower speed improvements than expected, even though the CACHEBOX was achieving good results at the network core. 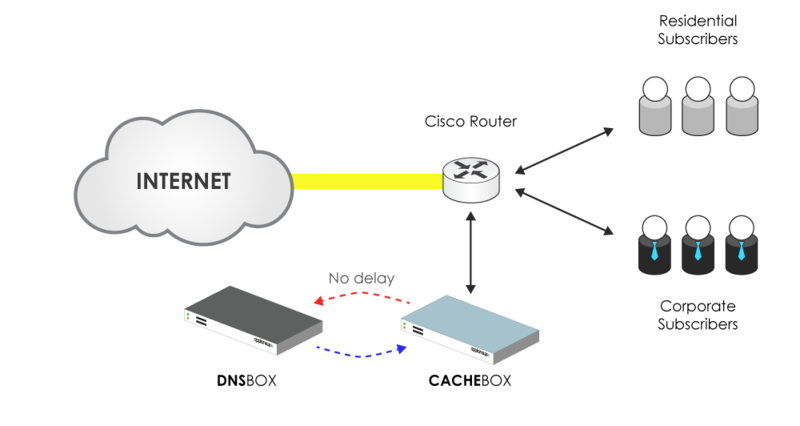 Looking to resolve this, ApplianSys’ support team analysed the traffic going through WAT’s CACHEBOX and found that DNS was the problem. Each time a customer requests a URL, CACHEBOX looks up the IP address from a DNS server before checking whether it has the content in its cache. As WAT had been using Google DNS this lookup process required a request to be sent over the internet and a response to be received, increasing the time taken to serve content to the end user. At peak times, this would result in very high latency.